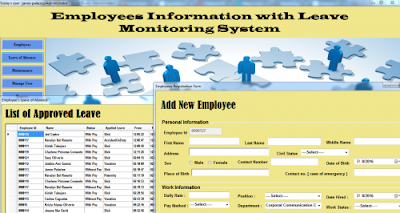 If you are looking for an Employees Information and Leave Monitoring System, well this one is what you're looking for. This system has the ability to track every employees activity within the company, most especially their leave of absences. Using this system,this allows you to see how often an employee made a leave in a month and all throughout, and it can be seen in the reports. We all know for a fact that manually monitoring the workers in a company may take you a lot of time but with this system, monitoring is just a breeze.